1. Too many files found during the scan, and physical memory becomes insufficient while the scan is still running. This cause is more usually seen for the huge drives larger than 2TB. 2. Some errors on the device which will slow down or totally freeze the scan process. 3. The connection of the drive might be lost. To find an efficient solution, please read the article carefully. a) Generally, you need to monitor a ‘frozen’ scan 1 hour at least in case that the Found files and progress bar change slowly. If nothing changes for 1 - 2 hours, please check Task Manager. 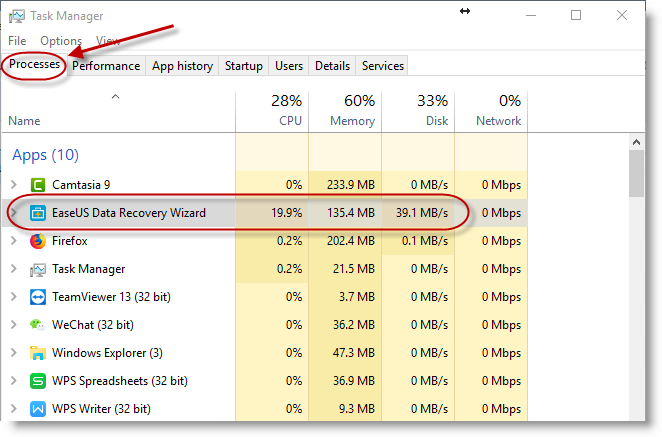 b) Open Task Manager (press Ctrl + Alt + Delete at the same time), and find EaseUS Data Recovery Wizard in the Processes. If the CPU, Memory, and Disk are changing, our product is still running normally. Otherwise, please go to Step 2. Please close other applications including antivirus and firewall to free up more memory space. Usually, this will speed up the scan. a) Please pause the scan and select the files to recover them. 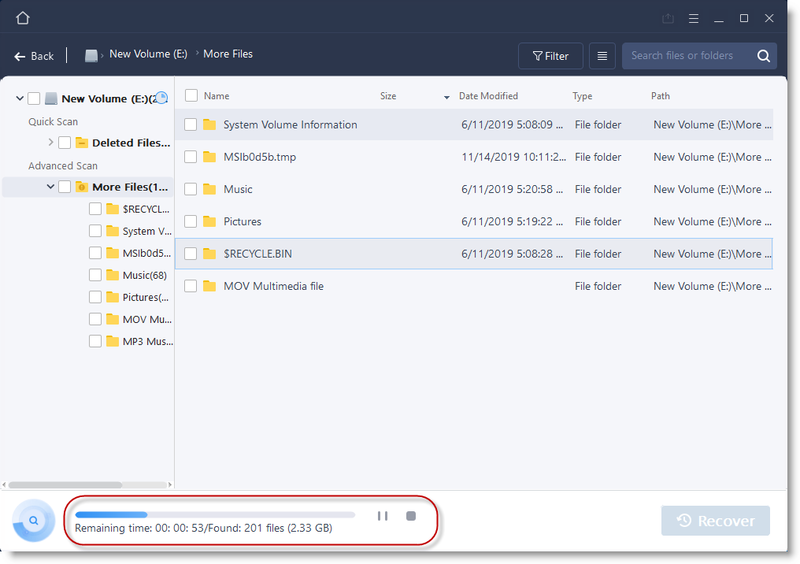 If the recovery prompts Recovery Failed or the recovered files are all 0KB, you need to keep running the software, then disconnect the drive and reconnect it. After that, please try to save the files again. b) It's also suggested to change a much more powerful USB cable to make sure the connection of the drive is always stable during the scan. It's recommended to use a USB Enclosure which has its own power cable to connect the drive. However, if it does not work either, please go to step 3. 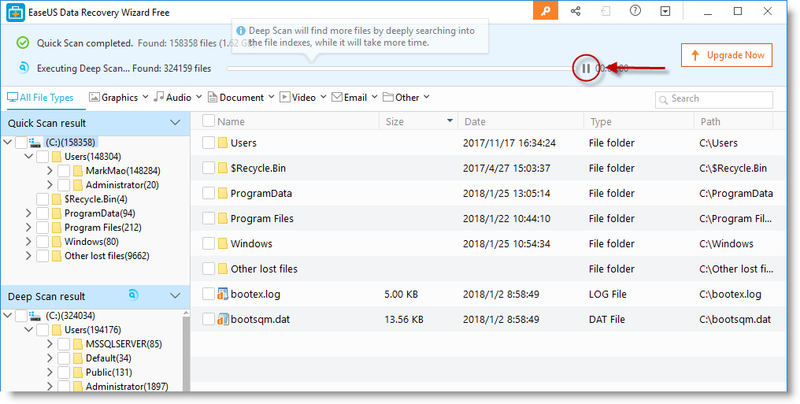 If you find the error appears at a specific point on progress bar every time, pausing the scan before the point and searching for the desired file from current result would also help you recover part of the lost data. Please start a new scan and pause it to recover the found files. The Pause button can be found right next to the progress bar. If it does not work either, please go to step 4. 4. Whether the hard drive has hardware issues. Bad sectors on a hard drive will prevent software from reading the drive normally and usually result in a frozen issue. If the scan still cannot be finished with a new scan configured as above section described, you have to check if the hard drive really contains some bad sectors or other physical errors. Some profession hard drive diagnostic tool can help you with this, e.g. HDTune. If it is verified that there are really some bad sectors existed, you would be at the risk of losing the files permanently. Please send the following info to Support Team if you still cannot finish a scan normally with the help of this article. 3. What are the file types that you want to recover with our software? 4. Did you do any changes to the drive after your data loss?